Intimate hygiene, body hygiene of delicate skin. Soften and calm irritations everyday. 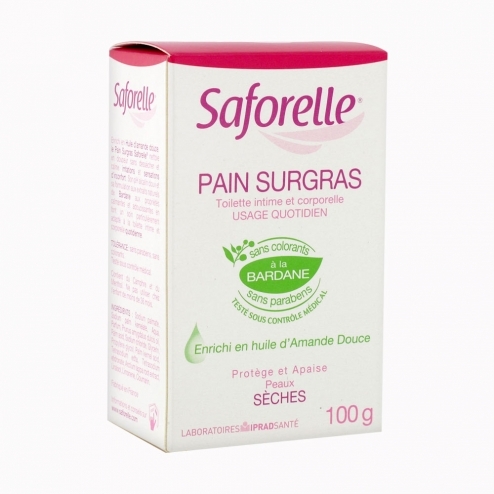 Saforelle is a surgras soft soap-free bread, pH 9.5, alkaline that cleans without deterging, softens the skin with sweet almond oil and soothes irritations with burdock extract, known for its soothing activity and calming. Its formulation prevents mycotic proliferation and can be used for daily hygiene of irritated mucous membranes and skin. sweet almond oil, burdock phytelene 0.6%, excipients qs 100%. Aqua, cocamidopropyl betaine, cocamide dea, stearamine oxide, arctium lappa, sodium chloride, peg 6 captylic / capric glyceride, sodium hydroxide, perfume, citronellol, coumarin, geraniol, d-limonene, linalool, tetrasodium edta, lavandula officinalis oil. Hypoallergenic formula without preservative.